Hi! This is Bruce, aka Buck, aka by my “trail name” of Colter. In 2010 I hiked the 2,650-mile Pacific Crest Trail (PCT.) This page is the journal of my trip. I have recently reorganized this page so the posts appear in order. Please click the links to the right to see an introduction to my PCT hike and for my gear list. Please check out my new highlights video! I’ve booked a plane ticket to San Diego for April 20, where I’ll be picked up by “Trail Angels” (Good Samaritans) Scout and Frodo (trail names, obviously!) who are veterans of a 2007 PCT thru-hike. Thanks Scout and Frodo! They will be putting me and several other thru-hikers up that evening, and then will drive me to the southern terminus of the trail on the Mexican border near Campo, where I’ll start hiking April 21. The ADZPCTKO (Annual Day Zero Pacific Crest Trail Kick Off) is 20 miles up the trail from the border and runs from the evening of the 22nd through the 24th. This is a major gathering of people associated with the trail. Most current year hikers will be there, along with many hikers from past years, along with friends and Trail Angels. I don’t take many “zero” (no hiking) days, and I’ll end up taking two immediately. But the ADZPCTKO will be a great place to meet the people I’ve met in the past, and that I’ll be sharing the trail with this year. I’m spending two weeks in Wyoming, making some final preparations before leaving for my hike. I just posted a hike plan on my intro page, showing the approximate time frame between trail towns and also my start and estimated finish date if all goes well. I feel as if I’m on schedule in arranging the myriad of details involved with leaving for months on a long backpacking trip like this. I had a 4 PM flight from Sheridan, but it was late so I ended up taking a later flight out of Denver. Jim and Jan, friends of the Manns, were kind enough to pick up a total stranger from the airport at 10:45 PM and bring me to the Manns, where they gave me a quick and quiet tour of a house full of sleeping hikers. I got my pack out of the large cardboard box it travels in and spent an hour in the garage sorting things out, filling water bottles, and filling my fuel bottle with the fuel the Mann’s provide each hiker. I must have got to bed about 1 PM, and at 4:45 the alarm went off. Now “Scout and Frodo” are cheerfully hustling around cooking up a huge breakfast. We leave for the border at 6 AM, where several of us will start our hike. Thanks to the Trail Angels, Scout and Frodo and Jim and Jan! 265 Miles/10% of the PCT Done! I hiked down to Highway 18 at about noon today, and it took only about 15 minutes to get a ride down to Big Bear City. The lady delivered me right to the door of Nature’s Inn, where I’m staying. The hike is continuing to go very well. My knees and feet are doing great. I really like my plain old Asics running shoes, they are a perfect fit for me. My equipment has been performing well too with one exception. I hiked out of Idyllwild and was soon back into the deep snow. I found a bare place to camp and when I was chopping snow to use for cooking my ULA Ice Axe broke!! I couldn’t believe it. I had stopped early in the afternoon so I spent a couple of hours making a very servicable repair. The next day was a long one of traversing the famously steep Fuller Ridge. I’d bought micro-spikes for traction and by using caution and by doing lots of map reading and floundering around by the end of the day the Saddle Junction to Fuller Ridge traverse was completed. And I was glad. I camped by a giant boulder and had an excellent sleep. The next day could hardly have been more different. For hours there was an “endless” descent with a series of countless switchbacks. From the deep snows to baking heat. From big trees to cactus. Half way down I ran across a wildfire. It had been started by a PCT hiker, as I had feared, a fellow I had met many times along the trail. He was using a cook stove, and the high winds just blew the flames into nearby grass and the wildfire raced up the hill. He reported it and identified himself, an honorable man. For me it was a “collision of worlds” when I came through the smoking fire as both a PCT hiker and a recently retired firefighter. The sound of aircraft and the smell of smoke and the crews were all very familiar. The trail goes through the underpass at Interstate 10. There, a hiker from the 2006 Class of PCT Thru-hikers, trail name “Chai Guy,” had a keg of beer! The hikers acted with remarkable constraint. ANOTHER Trail Angel, Dave, also showed up, and drove four of us to the A&W a few miles away, where we all bought ourselves a huge meal. The icy rootbeers in that heat were awesome. That eveing, I hiked to the Mesa Wind Farm, where they kindly allow hikers to get drinking water. I could see desert, dozens of wind turbines, and snowy mountains from my sleeping bag. Nearly every night I just roll out my sleeping pad and bag in a nice looking spot so camping is easy! There was another day of very scenic desert hiking, then I climbed thousands of feet back up into the snowy mountains. There was some more easily crossed snow patches. The afternoon became windy, and I actually moved camp after it became intense. I found a place in thick scrub oak on the lee side of the ridge. It froze last night and that with the wind called for my down jacket, balaclava and long underwear in my sleeping bag. This is a nice place to stay. I’m splitting a room with two fellow hikers, Old Scout and Danny. I got a giant burger, did my laundry, got partially caught up on email, and still have shopping and other chores to do. I’m still ahead of schedule. There’s big snow ahead in the Sierras so I don’t want to go any faster, but want to give it plenty of time to melt. It’s a sunny, mild day with a pleasant breeze, the kind of day where hikers work up a sweat on a long climb and then smile as the wind hits them at the ridgetop. Since Wrightwood, most of the last four days hiking have been along a reroute that was put in place to avoid a big fire from last year. On May 20 and 21, “Wyoming” and I walked the long roadwalk around the “Station Fire.” Anne joined us yesterday. At one point we had to do a reroute of the reroute of the reroute because of an official change combined with one missed turn. Most of this has been desert walking, with the most spectacular Joshua trees I’ve seen. We walked past Vasquez Rocks today, site of countless movie shoot-outs. There we met a group of kids from a rough neighborhood in L.A. They were polite, curious and incredulous that we were walking all the way to Canada. Tonight, and perhaps tomorrow night, I’m staying at the Saufley’s here in Agua Dulce. Me and about 20 other hikers, that is. I know almost all of them by name at this point. There is a shared spirit of adventure. This is a distinct culture of it’s own. The Saufley’s are some of the most generous trail angels on the PCT. They do everyone’s laundry, provide showers, set up big, cool, white tents for us to stay in, have bikes we can ride into town, arrange rides to nearby towns for those needing supplies, hold our mail, etc. I’m happy to say that I’m in good health and excellent spirits. I’ve only lost about 3 pounds so far. I’m often literally stopping to smell the flowers and to admire the scenery. I’m even farther ahead of schedule than before, so I’ll continue to take a relatively leisurely pace hoping for the snows in the Sierra’s, now reportedly up to 300+% of normal depth in places, to melt a bit more. There was a wonderful variety of cacti just past the Scissor’s water cache. This rattlesnake was on the trail, and was one of two that I’ve seen. As usual, it didn’t want trouble and soon disappeared. The winds were howling in the afternoon of April 27. These clouds indicated high winds aloft, and I was surprised by a light rain that night. There are occasional water caches placed by “trail angels” in key spots along the trail. Here a group of thru-hikers get some water and take a break. Eagle Rock, one of the most impressive rock formations I’ve ever seen. Two thru-hiker’s who met on the trail were married there this spring. Like this page? Then like it! I’ve been taking a photo of each nights camp. Most nights I sleep out under the stars, such as this night near Mesa Wind Farm. I hiked with Joker and Motor one day. Joker promised goodies in a Trail Angel cache at a place he knew. We were sad to find it empty. There are innumerable beautiful spots along the trail. There is still deep snow many places up high. Although it is rarely continuous for very far this far south, it still takes care in steep spots. Our small group of Wyoming, Anne and myself got up early, packed quietly, and were hiking from Agua Dulce by about 5:30 on the 23rd. We had some mellow ups and downs mixed in with steeper climbs and descents and more nice ridgetop breezes. The weather has stayed unusually cool. It seemed to be a fairly easy 25 mile day to San Fransisquito Rd, where we spent a night at the Anderson’s, another amazingly generous couple that bring hikers into their home and treat them like family. There were about a dozen of us hikers there. They had a sheet on the wall that every hiker signs, many with impressive artwork. We were served a big dinner and a good breakfast and were given a ride back to the trail. Anne is taking a few days off to fly back to the east coast to spend time with family. Wyoming and I are forging ahead. Yesterday we did 18 or nineteen miles, and today about 21 miles. There have been long stretches with little or very poor quality water so we are watching supplies closely. Today was Wyoming’s birthday. I got a candle from the Anderson’s and served her a Little Debbie’s snack cake with lighted candle at the 500 mile marker. This last stretch of trail has again featured a lot of variety, from big Coulter pines, cedars and oak trees to desert and many varieties and colors of wildflowers. Some stretches winding through the oaks reminded me of stretches of the Appalachian trail. We’ve got two 20-mile days ahead of us, and then I’ve got mail in Mojave and Wyoming has mail in Tehachapi. Looks like we’ll get some relatively cool weather as we head into the usually baking hot Mojave Desert. Wyoming and I made it here today and it’s a great place to spend an afternoon: showers, laundry, burgers, pop and lots of trail friends. The last stretch feautured a continuing variety of desert and mountains. I saw three coyotes on this stretch, and two more rattlesnakes. One was standing up like a coiled spring and was rattling like he meant business. It made me jump! But of course the reason he was doing it was as a warning and we took the hint. Mountain quail have been a common bird to see and we hear them calling often. There are big pines and cedar up high and Joshua trees are the signature plant down low along with cactus. We hitched into Onyx at Walker Pass and I ate nearly a half gallon of ice cream. It was great. A trail angel gave us a ride back to the trail and had left sandwiches in a cooler there. In an effort to not be greedy we split one, and were saddened to see in the morning that a bear had eaten all the rest. Drat! He was only about 100 yards away but as far as I know didn’t come near our camp spot. There were THOUSANDS of wind turbines in the miles past Mojave. At one point the wind blew so hard that it blew me right off the trail, even though I was leaning. There must have been some electricity produced that day! It seems, though, that about 10% aren’t operating, which makes me wonder how economically feasible they are. The weather has still been running somewhat cooler than normal and I don’t think we’ve seen anything beyond the 90’s yet. That still feels plenty hot when toiling up steep mountains with a pack: we climbed over 4,000 vertical feet yesterday along. There’s been blazing clear skies with low humidity most days, but a day or two have been cloudy and cool. The last couple of nights have been the warmest on the trip. There have been longer gaps between water sources in many stretches. One day one water cache was nearly empty, and it was something like 20 miles to the next cache which, as far as we knew, was empty. We knew it wasn’t when MilkSheik, just ahead of us, raised his hiking poles in triumph. On the downside the wind HOWLED all night long. Even though I was in a protected spot the racket made it hard to sleep. The last days we’ve usually been hiking from 20-24 miles a day. One day I did 26 when I had to backtrack 3 miles (and of course walk that stretch of trail for the third time to return) to retrieve my MP3 player which I’d left at a rest stop. It’s small and black and hard to spot in the shade, so I missed it even though I looked before leaving. There must have been about 100 miles of the trail between here and the border that have been burned by wildfire in the last ten years or so. It seems a bit sadder because the sorely needed shade has been destroyed along with the trees. Since Mojave there have been significant stretches where motorcyles are allowed in the areas, and although they aren’t allowed on the footpath, a few have ripped up the mountainsides and sections of trail. Many times the smog of LA is visible to the west. But overall it is truly amazing how skillfully the trail has been routed to maximize views and good walking and a wilderness feel. The miles have been going faster, in perception and in reality. Wyoming and I have decided to “flip” up to Ashland, Oregon to hike back to Kennedy Meadows in hopes of missing the deep snows ahead and enjoying the Sierras more. Will it be a good call? Who knows, but being flexible with planning is key to thru-hiking. As a reminder, we hitched north to Ashland, OR, to start hiking back south in hopes of encountering less snow. After finishing this “middle third,” we’ll go back to Ashland and complete the trail to Canada. Kennedy Meadows seems like a long time ago. Wyoming and I got a ride down to Highway 395 then starting hitching north. Our first ride was with the mom of a current PCT hiker. The drive was really beautiful, and our third ride delivered us to Reno. We tried hitching north the next morning, but failed after about four hours, even with really snazzy hitching signs. So we spent the day in Reno. I turned $6 into a sum of four figures! ($16.75) I cashed out a triumphant winner. With limited options we took the Greyhound to Ashland. It was a long night with the usual mix of bus people. Finally at about three the next afternoon we were standing at the trailhead outside of Ashland and it was great to be back on the trail. The landscape had a different look, with snow-capped volcanoes, and new and bigger trees and a lusher, greener look to things. We started seeing many more deer and other wildlife. At first the trail was snow-free and smooth sailing, but we’ve been encountering plenty of snow above 6,000 feet. We’ve been told the weather has run unusually cool late this spring with additional snow adding to the snowpack until very recently. One morning we woke up in a white world and with snow falling. We were soon in deep snowpack and walking along ridgetops with no sign of the trail for miles. When the snow and blowing got bad enough we decided to “bail off” the ridge, which was an adventure in itself. We ended up going down a steep creek in the rain and just when it looked like we might get “cliffed out” we found a logging road. We resupplied in Seiad Valley, a pleasant tiny town in Northern California. The next day started as a road walk followed by an easy but long climb through big timber. We camped next to the creek, and the next morning continued the climb into the Marble Mountain Wilderness. 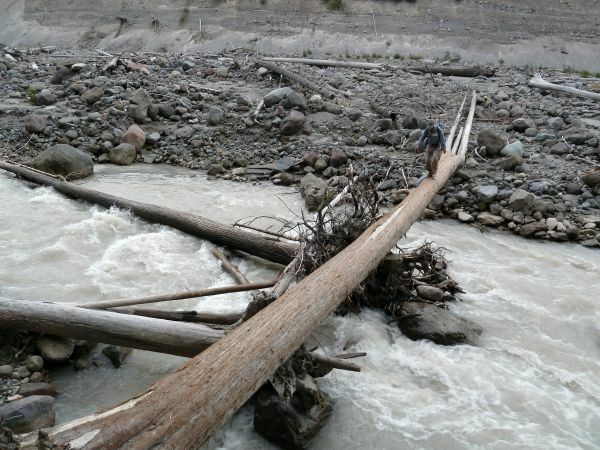 Bears had chewed the sign and even chewed off a timber of a footbridge. Soon we were in deep snow for long stretches and needed to keep close tabs of where we were on the map. The scenery was awesome, however. During a long snowy traverse we saw a black bear on a hillside, then began a long climb up a snowy face and skirted a cornice to arrive at the mostly clear ridgetop. Just before a campspot a bear ran across the trail right ahead of us. The alpine glow on the Marble Mountains was spectacular that evening. The next day we saw three bears before noon. With discretion being the better part of valor, we decided to take a lower trail to the Etna Pass area. Imagine our disappointment to find a seriously flooded creek after hours of descending. We tried to cross but Wyoming took a dunking so we decided to dry out her stuff and try again in the morning. Snow-melt fed creeks normally fall during the night, but not this time. The next day found us backtracking the long slog back up to the summit and down the other side. Last night I tried to call my old smokejumper buddy Murry Taylor who lives nearby. To my surprised I talked to another old jumper who was staying a few days, but Murry was away. It turns out I’d just missed not only Murry but other old Alaska jumpers like Tom Boatner and Don Bell. Wyoming and I completed the walk to Etna today. This is a really nice town. I’m impressed with Northern California. We’ll likely take a day off here. Huge cedar, pine and fir trees are common and one of my favorite sights along the trail. We were tired after we climbed to the cornice on the top of Jumpoff Ridge in the Marble Mountain Wilderness. More than enough snow up high in the Marble Mountains AND the Trinity Alps! Huge logs sometimes block the trail. Independence is a beautiful little town. Here we are hitching north to Ashland. Lupines are one of the most beautiful, common and sweet-smelling flowers along the trail. They seem out of place in the desert. Taking a break in the shade of a Joshua Tree, just past the Los Angeles Aquaduct. This rattlesnake was doing his best to warn us away and was very effective in doing so. Wyoming takes a break in the Mojave. As a reminder, I’m hiking the “middle third” of the trail southbound, to give the Sierra snows more time to melt. It’s summer and I’ve passed the thousand mile mark! I’ve been on the trail for over two months. I’m at the Heitman’s, who are Trail Angels here in Old Station. There are three other hikers here as well, all southbound. I took a low alternate route out of Etna before getting up on the crest in the center of the Trinity Alps. The ridges and the Trail were mostly buried in many feet of snow. I walked about 1/4 mile across a frozen lake on June 19! Wyoming took a lower route and is about a day behind me according to the “trail grapevine.” I took lower trails to Castella, after which I’ve been back on the PCT itself. I’m being careful to “connect my steps” at all times. In other words when the summer ends I want to have walked the entire distance from Mexico to Canada. I’ll hike alternate trails where necessary, and the official trail when I can. The last three days or so have been entirely out of the snow and on the official trail. Although there will be plenty of snow walking around Lassen Peak, and much more ahead, now that summer is here it should slowly get easier. I didn’t expect to be fighting so much snow in California in the summer. There is so much more wildlife here than in southern California. It’s now common to see deer. The sound of calling quail is part of the soundtrack of the trail. One evening I heard something quietly coming down the hill, crawled out of my tent, and a large brown phase black bear was working his way down hill towards me. He was a confident old fellow, feeding calmly and only hurrying a short distance as I winged stones past him. Finally he got the hint and ran off. One morning I heard something ahead and stopped to watch. A blacktail doe stepped out on the trail and looked back. Moments later a tiny spotted fawn stepped out and carefully watched his footsteps as he worked his way down the hill, closely followed by an identical sibling. There are now many mosquitoes at times, mostly in the evenings, along with an assortment of flies and knats and bees. Not much of a bother for me, though. I’ve been hiking about 20-30 miles a day recently, a little bit less when getting into a town sometimes. I’m holding up well physically, with very little weight loss, primarily because I took it fairly easy on the first part of the trail to let the snow melt a bit more. My feet are in great shape. Any little aches and pains elsewhere move around or fade, which is a good sign. When I walk, I cover about 2 1/2 miles an hour, a bit more when it’s really easy going, and sometimes considerably less when it’s snowy. Snow slows things down for many reasons. On sidehills it’s sometimes necessary to kick steps so I don’t slip. Along some stretches, the trail might be completely covered for long distances, sometimes miles. Route-finding takes time and can be mentally taxing: “is this the right ridge? Would it be easier up the hill or down the hill? Can I safely cross this face?” One big advantage is the snow is consolidated, meaning it’s dense which in turn means “post-holing” is rarely a problem. Near logs and boulders it’s important to be very careful though, because it’s often melted out around those places forming unseen little caves. My morale is good. Initially it appeared that Wyoming and I were the only ones hiking south from Ashland, (we were greeted with excitement by many people as we were the first thru-hikers of the season in several towns) so I was wondering if it had been a wise decision or not as we were hitting snow. But we’ve since encountered several other people who started into the Sierras and then decided to do the same as us. The bottom line is that in this unusually tough year, some say the snowiest in PCT history, there is no easy way to do things. I plan to head out later today. It’s going to be above 100 degrees not far away from here, hopefully lots of snow will be melting in the high country and the streams will not be too full. One way or another, I’ll get through safely and have some adventures along the way. 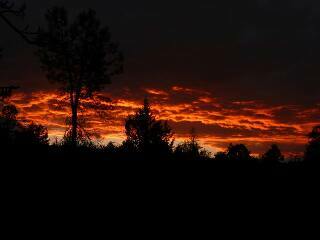 Being outside every day provides many chances to see spectacular sunrise and sunsets. I woke up at 3:00 AM to watch this lunar eclipse on June 25, and it was well worth it as I lay in my sleeping bag watching the shadow of the earth cross the moon. 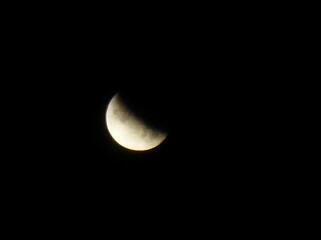 It lasted much longer than I expected and I packed up and was walking as the eclipsing moon was setting in the west. Burney Falls is the most beatiful falls I’ve seen so far on the PCT. This a is standard stop for hikers and where I saw two other hikers, “Psycho” and “Apricots.” They were the first thru-hikers, other than Wyoming, I’d seen in about two weeks. Psycho proposed to Apricots on top of Forester Pass! 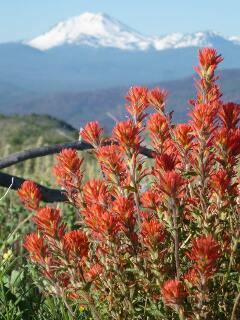 Indian Paintbrush flowers are just one of the many species along the trail, and one of my favorites. Here they are against the backdrop of Lassen Peak. Post-holing. Meaning where you sink into the snow with each step. Luckily, with the conditions I’ve been encountering the snow is firm enough so this is rarely a problem. Slipping. A potentially very big problem on steep mountainsides. Often requires rerouting, kicking steps into the snow, and good judgment in general. Moguls. Where the normal trail is generally level, the snow often melts out into moguls requiring countless small climbs of up to five feet or more. Downfall trees. The deep snow has knocked down thousands of trees. I must have crawled over, around and through many hundreds of them on this hike. Route finding problems. Whereas it is usually easy to follow the PCT in most stretches, sometimes the trail is covered for miles and hours, making finding the way difficult. Tree/Rock wells. The snow tends to melt out around trees and rocks, first. Sometimes these “wells” are hidden and can result in a nasty fall. High water. One of the hikers staying here last night said she actually had to SWIM one creek filled with melt-water! There are many exciting stories of crossing high water caused by the above normal snowpack melting. Mental fatigue. All these issues are mentally as well as physically draining. Finding safe creek crossings, evaluating snowy mountainsides, wondering whether summer will last long enough for the hike to be completed, route-finding challenges and the like wear people down mentally. Despite the challenges, the experience is largely what you make of it. I’m still making good progress and rarely walk less than 20 miles on a full day of hiking. I’m comfortable with cross-country, off-trail travel which is a big advantage and I like to think I have enough experience with snow and river crossings to make good decisions. I’m still on schedule to complete the hike in late September. The snow line is slowly moving up and one way or another in a few weeks I’ll be in Kennedy Meadows. A few days ago I ran across the first Northbounders, five young fellows that had walked straight through the Sierras from Kennedy Meadows. Needless to say they, and all of the 20 or so Northbounders that I’ve passed since, have tales of snow and high water. But I think most are proud of having overcome the challenges. Although I think the “flip” up to Ashland helped us avoid some of the more dangerous snow/water, I think most Northbounders don’t realize how much snow there’s been all along the trail regardless where people are hiking. There was a stretch of trail north of here where I didn’t see another hiker for about ten days. Around the 4th of July day-hikers started showing up, and in the last few days I’ve seen quite a few hikers including more and more northbounders. I’ve seen a few more bears. Most of the bears in this region are a brown phase of black bear. Wyoming was hiking with me one day when we saw an especially glossy pair of brown black bears feeding in a meadow one evening. Very fun to see. I’m staying at yet another “Trail Angel’s” home here near Donner Pass, in a beautiful home amongst the trees overlooking Donner Lake. The kindness of people along the trail, in providing information, rides to the grocery store, and support in general, is truly amazing. It seems as if the wildflowers have been at their peak for weeks! We had hiked a nice long snow-free stretch when we encountered this stretch of snow from Etna Peak to Gibraltar and well beyond. We climbed straight up the ridge to avoid side-hilling through slippery, steep snow. Over three months on the trail now. The country since Donner Pass has been the most beautiful on the whole trail with hiking at 10-11,000 feet in places. I stopped to see my cousin Pam and her friend Tim who live near the trail and Lake Tahoe. She has a good life there and I think it would be fair to say that we are literally “kindred spirits.” Pam, thanks for the great meals! It’s a 200 mile push from here to finish the HIgh Sierra and drive the “Golden Spike” at Kennedy Meadows and finish California. What a spectacular and varied state it’s been. The weather overall has been wonderful, with only a handful of days or so with soaking rains. By good luck, just after I arrived in my motel room here there was a crashing thunderstorm with pounding rain. There have been far fewer afternoon thunderstorms on the PCT than there were on the Continental Divide Trail where I frequently had to “bail off” the ridges to avoid lightening. Mosquitoes have been plentiful in many places. I’m glad to have my screened shelter at night! The big news is the snow, or rather how fast the snow situation has changed. A little over a week ago I was being warned of the deep snow and dangerous river crossings ahead. But the snow line has been climbing faster as summer advances. I’ve been delighted to find days of easy going Sonora Pass, (see photo below) which has the reputation of sometimes being dangerous, was a piece of cake. The soft snow makes kicking steps easy in the remaining patches. The rivers have receded. I hope the situation remains the same for the next couple of weeks. I rarely get sick on the trail, I’m happy to say, but I got a bug of some kind; bad food, bad water, flu or whatever, and felt mighty lousy for a couple of days. I must have lost five pounds, so I’m looking pretty lean right now. Like a thru-hiker you might say. On through this last stretch there has been a lot of weekend hikers but I can usually spot the thru-hikers from a distance: whiskered (at least most of the guys,) skinny, faded, tattered and dirty, with a confident, mile-eating gait and carrying small, compact backpacks. The trickle of north-bounders I was passing grew to a flood of about 20 a day at the peak, and has since diminished again. It was fun to see familiar faces from what seems like a very long time ago in southern California. Some of them were obviously invigorated by the rigors of the Sierras, many more have been considerably worn down mentally and physically, and some have simply had enough. As one dejected hiker told me while sitting slumped on a beautiful ridge-line “I’ve been out here a long time.” One way or another, summer will go fast. Those in this area who have been northbound the whole time still have 1700 miles ahead of them and winter is likely to hit before they reach the border. I am still on schedule and will be back in Oregon in early August, and with luck will have time to complete the trail. Along the PCT, July 11. The Desolation Wilderness, July 12. This was one of the last long stretches of snow for me. At least for now! Sunset above the East Fork of the Carson River. July 15. Traversing the north slope of Sonora Pass on July 16. Peaks in Yosemite National Park, July 22. Mountains in the Ansel Adams Wilderness, July 24. August 8, 2010, Day 109. Kennedy Meadows, CA; 1,737 Miles. 65% of the trail done. As a reminder, I’m hiked the “middle third” of the trail southbound, to give the Sierra snows more time to melt. The High Sierra and California are done! It’s hard to believe it took me from late April until early August to walk across the winding trails of this state, but it was a wonderful if sometimes difficult experience. One of the great delights of this last section of trail is how the horror stories I had repeatedly heard about the deep snow and dangerous passes ahead of me, simply didn’t materialize. Summer has finally won out in the Sierras and the toughest passes had some snow patches left but they were very easily crossed. Dangerous river crossings from earlier in the summer were now a piece of cake. I walked many days without even getting my feet wet. On this stretch I hiked my longest stretch without a resupply, about 190 miles total from Vermillion Valley Resort to Kennedy Meadows, including a side trip to Mt. Whitney. In the last four full days I hiked about 104 miles. That included crossing high passes including Forester Pass, the highest point on the PCT at 13,200 feet. It was a piece of cake now, and hard to imagine how it would be when icy, as the trail was a true work of engineering hanging on the mountainside in places. That stretch also included climbing Mt. Whitney, the highest mountain in California and the Continental U.S. It was beautiful up there. There were many John Muir Trail hikers on the last stretch, and I only saw a handful of PCT hikers. When I get back to Ashland I’ll be seeing many again. I often like to think how it is so important to see and appreciate the magic of a long hike, otherwise it can easily become a tedious slog. Two nights ago I walked until dark and simply rolled out my sleeping pad and bag in the sage to sleep. Before I fell asleep I watched the stars for a while, and saw three meteors streak across the sky in about 30 seconds. When the snow was deep in northern California, I spent much of one day walking along a snowy ridgeline. At one point the snow was about 20 feet deep with a spectacular curled cornice of snow. In the breeze across the ridgetop fluttered a steady progression of butterflies. On another high pass I sat down for a break an a marmot walked by me about 4′, looking at me as if I were a rock he hadn’t noticed before. Another evening the trout were jumping steadily in a feeding frenzy. I got several photos of trout out of the water by simply pointing my camera and pushing the shutter button. I’m still on schedule to complete the hike, despite the deep snow and all. I’ll have to average about 20 miles per day to finish the hike in September as planned. Oregon tends to be fairly easy hiking and I hope to put a few miles “in the bank” by walking over 20 most days on that stretch. Enough food for about 8-10 days, including oatmeal, granola, Pop-tarts, peanut butter, Knorr’s Sides Plus, butter, instant potatoes, jerky, tuna, Craisins, a giant bag of peanut M&Ms (the very best item on the list,) one freeze-dried meal, and a few more misc items. There were blacktail deer along the PCT in Northern California, but in this area I was seeing mule deer. It’s always fun to see wild animals, and this was an especially scenic meadow on a typically beautiful evening. August 20, 2010, Day 121. Bend, OR; 1,962 Miles. 74% of the trail done. The logistics of getting from Kennedy Meadows to Ashland proved to be difficult once again. Generous people gave me a quick succession of rides to Reno, where the hitching again came to a screeching halt. Again I had to take the bus all the way to Sacramento and then north. But this time, my old smokejumper friend Murry Taylor picked me up at Redding late at night, and gave me a ride back to his place near Etna, CA. It was great to see him, and I’m hugely impressed with his log home he built. Not only a famous author (Jumping Fire) but a skilled builder, too. After a day relaxing in the area, Murry drove me up to Ashland where I met another friend, Ed Now, for a short visit at the trailhead. In this stretch I passed Crater Lake, a very deep blue. The trail has been relatively easy and and direct since getting back to Oregon. I’m putting some miles/days in the bank, doing from 25-30 miles each full day. One day I even did a full 40 miles. There are people for whom 40 miles is no big deal, but that’s my longest day ever. I’m usually packing as soon as it’s light enough to see, and while I take breaks as needed, hike fairly steadily until around 8 PM. A few nights ago there was a major thunderstorm came through, and I’m happy to say I got my tent set up just before it hit. The rain pounded down, accompanied by some serious lighting. I was in a good spot, however, and stayed safe and dry. I’ve only seen one other “northbounder” PCT hiker on the trail since getting back to Oregon, although I’ve seen four at resupply spots. There are several along this stretch of trail, though, so I hope to see more, soon. Two evenings ago I saw a smokejumper plane fly past as I hiked down the trail, then it made an orbit or two, then fly away. An hour or so later I suddenly smelled smoke, and knew it was almost certainly the fire they’d been looking for. I had to wait until morning to call in the fire, talking directly to fire dispatch in Redmond. At some point they ended up jumping that fire and at least two others in the area, although they might have been manned before I smelled them. It was fun, nonetheless, to think of the jumpers up in that plane looking down, searching for good jump spots. To be truthful, at that moment I’d have loved to be one of those smokejumpers. I’ve jumped, and fought, quite a few fires in this area, both as a smokejumper and on an engine crew years ago. It’s good to see the beautiful Cascade mountains of the area. This morning I walked down to Elk Lake and another old smokejumper buddy, John McColgan, picked me up, and he and his kids drove me back to his beautiful home just outside of bend. Right now I am looking out the window at the still snowy Three Sister mountains. Like Murry, John is treating me like a king. Thanks John! At this point I’m still on schedule to finish the PCT in late September. I’ll likely only get to post a couple more times or so in the coming weeks, so patience might be required. Have a good day! I usually do my cooking for the day at running water, if possible, like along this beautiful brook. The trail runs along the rim of Crater Lake. Some very impressive scenery! September 8, 2010. Snowqualmie Pass, Washington. 2403 Miles Completed, 254 Miles Left! The miles have been flying by. Fall hit the Pacific Crest Trail for me in the Three Sisters area. The weather has been much cooler, and the fall colors have been coming on strong. I have been averaging about 25 miles a day for weeks now. The days are getting shorter but I’m packing up as the sky starts getting gray in the morning, and hiking fairly steadily with fairly short breaks until near dark. For me, that means actually starting my walk around 6:30 and stopping to set up my tent sometime before 8 PM. My old (as in from past years) smokejumper buddies Mike Fitzpatrick and Steve Dickenson met me at Timberline Lodge on the base of Mt. Hood. Mike treated me to a great buffet there while we exchanged a long string of smokejumper stories. The tales kept on coming as we headed to Steve’s house, where he made us a great dinner. It was really fun to see those guys. By chance, I ended up in Cascade Locks for “Hiker Days.” It was really fun to see many thru-hikers I know from the trail, many of whom I hadn’t seen for hundreds of miles. There was a big raffle. I’d got a pile of tickets as a way to donate to PCTA and ended up winning a backpack, a bear canister, and a wool hat! Not surprisingly, perhaps, there have been several days of rain here in Washington. Yesterday was a real soaker. A big plus is the fall colors are getting very bright now. The huckleberry bushes are thick and there are all the berries I want it many places. There are also blackberries in places and even raspberries and thimbleberries. One evening I had a beautiful camp at the base of Mt. Adams. In the evening, the orange alpine glow on my camp and the mountain is something I’ll never forget. St. Helens in the distance and the looming Rainier have added to the backdrop of the hike. The Goat Rocks Wilderness was as beautiful as described, rugged and still snowy in stretches. I hit the “Knife Edge” area early in the morning while the snow was frozen and had to use a rock to chop steps across an especially steep section. Later in the day when the snow was soft it would have been no problem. Three days ago I ended up Urich Cabin along the trail. I finally caught up with Wyoming, my hiking partner from earlier this summer. It was really fun to see her and catch up on the news. Also there were several more thru-hikers there. Dicentra, author of a backpacker cookbook, and her friend Hoosier Daddy were there with “trail magic.” We had some great chili that evening and pancakes in the morning! Magic Man had brought Krispy Creme Donuts, too. What a feast! I’ve seen mountain goats in places, deer of course, and many elk recently. One foggy morning a few days ago I heard the first bull elk bugling. And this being Washington in September, it’s not surprising that there has been plenty of rain. It rained nearly all day yesterday, and when it wasn’t raining it was still soaking wet with the huckleberry bushes crowding the trail and the trees dripping down. Basically, I am often soaked below the waist all day long, damp above the waist, and toasty warm and dry at night, when I sleep soundly about nine hours a night. My smokejumper bro Rod Dow met me at White Pass and brought me a hot meal and four days of smokejumper food, all of it “his treat.” His generosity has continues as he picked me up at Snowqualmie Pass and I’m now at his house here an hour east of the trail. More smokejumper tales, and plenty of belly laughs. There is some fairly steep and likely wet hiking ahead, but if things go well I’ll finish the trail around September 21 or thereabouts. It’s been a grand adventure, but at this point most of us are pushing towards Canada to reach our goal and to limit the amount of rain, or snow we are likely to experience. I’ll post on my website in the future with more photos and stories and a hike wrap-up. Enjoy your day! September 11, 2010, Day 143. Steven’s Pass, Washington (Skykomish); 2,476 miles, about 190 miles left!! If you missed it, I also updated my blog (see link above) from Snoqualmie Pass, which I’ve reposted, below. I am currently at the Dinsmore’s, who are trail angels here in the tiny town of Baring, just west of Steven’s Pass. I’m still averaging nearly 25 miles a day, although I’ll be slowing down in the days ahead just a bit. It’s been much rainer recently which means limited views much of the time. But today it partially cleared for the latter part of the day and the swirling clouds revealed many beautiful peaks and lakes. The fall colors are getting better and better. The trail is more rugged than Oregon and the weather much cooler. The mosquitoes are long gone now. This morning the rain cascading off the soaked berry bushes as I brushed against them was so cold that my running-shoe clad feet ached. One advantage is there is plenty of water for drinking and cooking! I hope to finish the trail in ten days or so, on or about September 21. Right now I’m going to go run to the cafe to try to get something to eat before it closes. If I have time, I might post a couple of photos before I head out of town. If not, I will be posting at least one more update on the end of the trail, along with photos and perhaps even some video clips. Alpine glow on my camp in the Mt. Adams Wilderness, Washington. September 20, 2010, Day 154. Manning Park, British Columbia, CANADA!!! ; 2,665 miles, 0 Miles Left! I reached the border on a rainy/snowy day, at about 12:15 Pacific Time on Monday, September 20. The fall colors were spectacular, but it was likely the coldest, wettest day of the entire hike. A hiker that came into Manning Park a few hours behind me said he had ankle deep snow by the time he got off the crest, while the snow was melting as it fell while I was there. So, I’m happy to say, I beat the fall snows. I have been traveling from Manning to Vancouver to Seattle to here in Whitehall, Montana, where I’m visiting my friend Jim Griffin and family. I’ve added a couple of new photos, and will post some more stories, photos and reflections when I get caught up a bit more. Thanks to everyone for your support during my summer on the trail! Me at the U.S./Canada Border, September 20, 2010. Fall colors along the Pacific Crest Trail, northern Washington. Below are some selected photos from Cascade Locks (on the Oregon side of the OR/WA border) to Canada. A medium sized old-growth tree had been sawn off the trail, and I took 20 minutes or so to count the rings. It was 658 years old! The largest trees must have been over 1,000 years old. The fall colors and the mountains made for some beautiful scenery. Glacier Peak was spectucular and visible on the fairly rare completely clear days. Pacific Crest Trail Days was fun. These are some of my fellow thru-hikers. L-R: Plain Slice, Little Engine, Shades, Max Chill, Slim Jim?, Hasty, Charmin, ?. Ripe blackberries were plentiful in some places at lower elevations. After some rainy days the sun rises through fog. This alternate trail south of Cascade Locks brings hikers behind this high falls. Very cool! It’s been a little over a week since I finished the trail, and I’m slowly getting caught up on emails and details that need to be handled in “the real world.” Below you’ll find several more photos from the last three weeks on the trail. I’ll be posting more about the hike in the next few weeks, so please check back! This summer people often asked me “Would you do it again?” I’d tell them that if I hadn’t done the PCT yet, I definitely would, but having done it once now, I wouldn’t hike it again, instead I’d choose one of the countless other new adventures still waiting out there. December 8, 2010: Fairbanks, Alaska. Some reflections of the Pacific Crest Trail. Thanks to “The Graduate” for this photo of me on a river crossing in northern Washington. His caption for the photo says My least favorite crossing on the whole trail – Suiattle River on the slopes of Glacier Peak. See hiker on the far side of the log for perspective. Crossing a log like this is potentially quite dangerous. The Graduate (his trail name, of course) had crossed just ahead of me, so naturally I had to cross without hesitation! It’s 20 below this morning here in Fairbanks, on a typical December day. I’ve been back home for three weeks, and now that I’m getting caught up on things I wanted to take a look back on my hike of the PCT last summer. I finished the trail on my 5th pair of shoes. Like most thru-hikers nowadays, I hiked in running shoes. Counting days off, travel days while on the trail, town visits and the like, I averaged about 17.3 miles a day. Not counting days off (days off included the “Kick-off,” two trips to Ashland Oregon for my “flip,” as well as rest days) I averaged about 19.9 miles a day. I lost about 12 pounds or so when I was at my thinnest. Towards the end I had actually regained a few pounds, even though I rarely ate the 1/2 gallon cartons of ice cream anymore. The expanation, I believe, is that my body simply became more efficient. From Ashland, Oregon, to the Canada border I averaged 23 miles a day including all time off. Usually I was hiking 25-30 miles a day on full days. Most hikers finishing towards the end of September had a similar pace: they hiked slower for the first few hundred miles of the trail to let more snow melt, but even so were slowed down by the deep remaining snow when they hit the Sierras and/or northern California. In Oregon and Washington we were all “running for the border” to beat as much autumn rain and snow as possible. I was amazed at how fast people were hiking in the last 1,000 miles of the trail. It was a dramatically faster average pace than I observed on the Appalachian Trail, although I think the miles were slightly easier. The trail was about 2,665 miles long, including the hike to Manning Park where, like most PCT thru-hikers, I spent a night before catching the bus to Vancouver. Historically, about 37% finish the trail. 15% depart due to injury, 5% due to weather, and 43% due to emotional or other reasons. I would make an educated guess that the number of people leaving the trail due to weather was much higher this year due to the deep snow in California. But I salute everyone who gave the trail their best shot. Teddy Roosevelt said: Far better it is to dare mighty things, to win glorious triumphs even though checkered by failure, than to rank with those poor spirits who neither enjoy nor suffer much because they live in the gray twilight that knows neither victory nor defeat. I was reminded of how many things can end a hike when I got sick for several days in central California. I know several people, strong, tough, smart hikers, who left the trail because they’d just had enough for the year. Many times in life it’s smart to quit while you’re still having fun. This hike was by far the my most social long hike. On the Appalachian Trail I was usually hiking fast enough so I’d meet people and then not see them again. On my Alaska traverse there weren’t other hikers! On the CDT there were hardly any thru-hikers to meet. On the PCT I was hiking a similar pace to many other hikers. Although I still naturally gravitated towards hiking alone most of the time (I enjoy “hiking my own hike,”) I must have hiked with about a dozen other hikers off and on and of course got to meet scores more thru-hikers along the way. It was fun getting to know so many kindred spirits. The PCT was a tougher hike than I expected, and it was definitely because of the unusually deep snow and high water. I think on a normal year most of us would have finished a couple weeks earlier with the same amount of effort. Also it was rainier than normal in Washington. Day after day of cold rain takes it’s toll, too. I had just as much fun hiking all the pretty parts of the trail and skipping the places that were too cose to towns and thoroughfares. The 10 fwy isn’t my idea of hiking and I know I didn’t miss anything. I feel just as accomplished as anyone. I starteed when I was 15 years old and am now finished at 51. “Hiking your own hike” is the most fun and the way to live. Congratulations on your many years of fun trips. Well you’ve inspired me to give this trail a try. It sounds more challenging though than the A.T. This time last year I was just a week into my thru hike of the A.T. Your story brought back all those wonderful memories and makes me wish I were back out there just walking into exhaustion and savoring the beauty of the wilderness. I’m pushin’ 60 though so I’ve got to do it soon.Thanks for your blog. Thanks! The PCT is a great trail, as is the AT. They both have their own challenges. The AT feels steeper, and it is usually much rainier. The PCT is more remote and wild with tougher river crossings, more snow and higher. And each trail has its own unique magic. 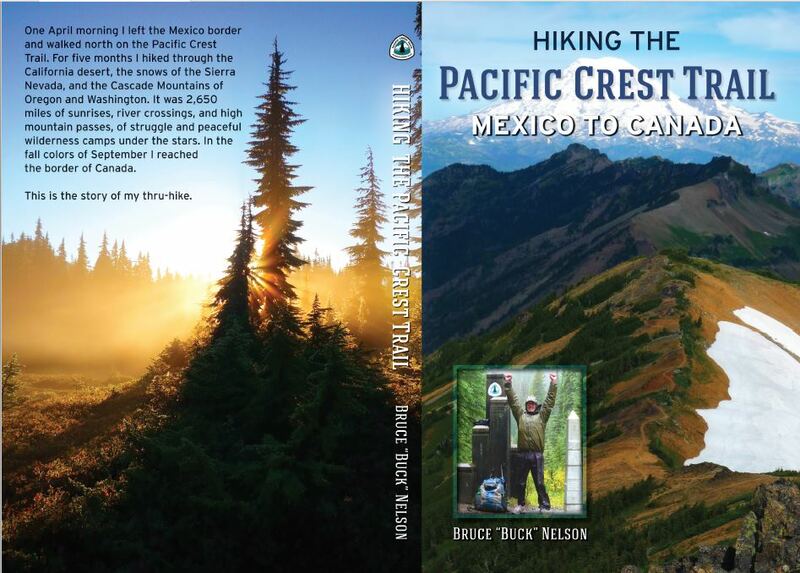 I hope you do the PCT soon and it is a wonderful adventure for you.